Indications Redness Reliever. Antihistamine. 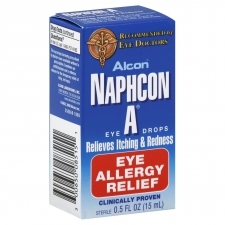 Uses: For the temporary relief of redness and itching of the eye(s) due to ragweed; pollen; grass; animal dander and hair. Directions Adults and children 6 years and over, put 1 or 2 drops in the affected eye(s) up to 4 times every day. Children under 6 years, ask a doctor. Ingredients: Benzalkonium Chloride, Boric Acid, Edetate Disodium, Purified Water, Sodium Borate, Sodium Chloride, Sodium Hydroxide and/or Hydrochloric Acid.